Another older program that some people might find handy on a mac (mac only at this stage but they are looking for a win version this year). 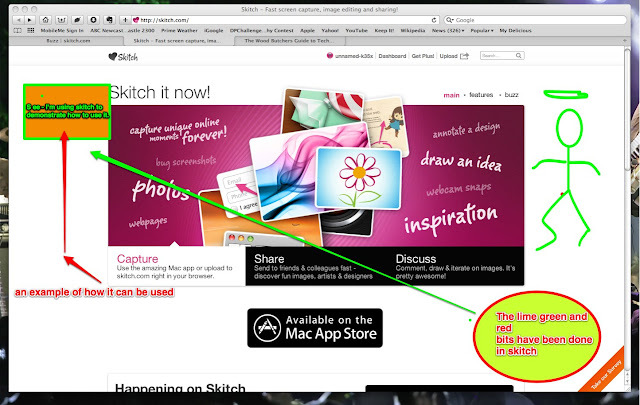 Skitch is the program. It is a freebie - but you can get the pro version for $19.95 US for a year. It has a number of extra and handy features. But I am just going to mention the free version. What does it do ? Well - first and foremost - it will grab (or skitch) any screen shot. Doesn't "command,shift &3" do the same thing on a mac ? Yes it does but sketch has a few handy and concise features. It can grab a whole screen or part of; it can save it to a number of formats (png or jpeg on free version - a lot more on paid version); you can draw or write on the screen shot. This is particularly handy for presentations or instructional work. The screen shot below was "drawn" on using sketch. It also can be used as a drawing program - to construct diagrams or illustrations for web or print use. Photo's can be treated. It will even use your iview camera. Sharing, of course is a strong point of the program. It has it's own storage area or you can choose to share your pieces in the usual way. Skitch doesn't do anything that a number of other programs can't do - but it's handy having them in one place and easily accessible. It can screen capture, crop, resize, sketch , text and share - all very fast and easily. If you haven't come across it before - download it and give it a go. Twitter, podcasts and all things Stephen Fry ! All laptops are created equal ?